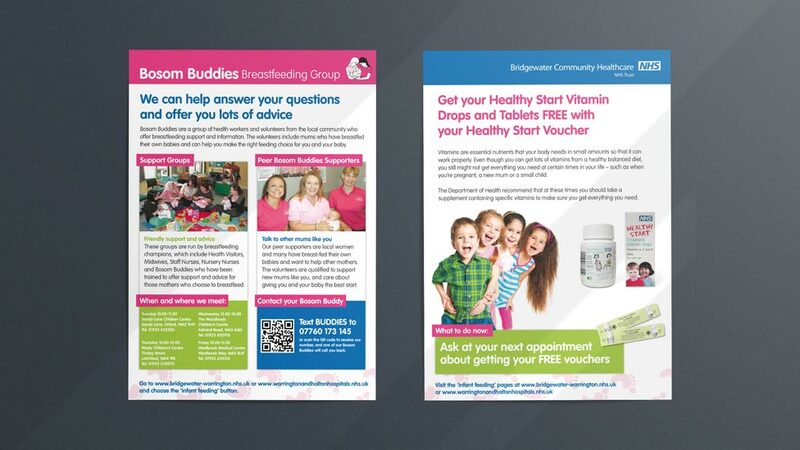 We have many years of experience working with different sections of the NHS on health awareness campaigns, so we were delighted to be involved in the breastfeeding awareness campaign initiated by the Warrington Health Improvement Team (WPCT). The brief was simple – to create materials for a health awareness campaign that would encourage predominantly young mothers to breastfeed their newborn babies rather than bottle-feed. Research has shown that babies who have been breastfed since birth have better health that those which haven’t. Together with a Unicef initiative the WPCT wanted to communicate this to their patients and the public. Having already created some pieces for the health awareness campaign themselves such as pull-up banners, the team wanted the additional materials to follow a similar theme. We took the colour scheme and font from these and developed the style further into posters, information leaflets, contact cards and direct mail to GPs. Working with the WPCT team we planned how much and which information would be suitable for a GP clinic’s display board. The health awareness campaign materials had to comply to Unicef guidelines in terms of content so that was a key consideration too. Although aware of the benefits of breastfeeding to both babies and their mothers, the team were aware that display space within local surgeries and health centres is in high demand. 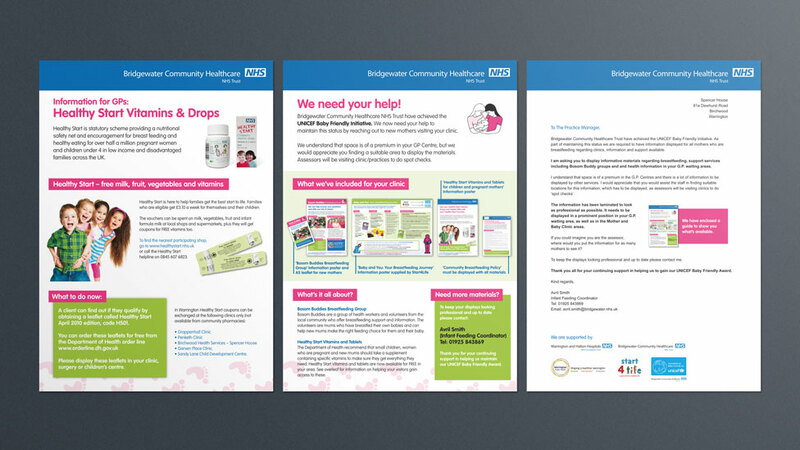 In order to tackle this we created a direct mail piece to send to GPs and practice managers which consisted of a letter and an A4 leaflet folded to DL. The direct mail gave information about why the materials had been produced and how they should be displayed. The health awareness campaign graphics received a great reaction from the WPCT team and those who have used them. “I could have wept, we have never had anything like this in all the years I’ve worked for the Trust, (over 17 years) I’m thrilled with the posters! !